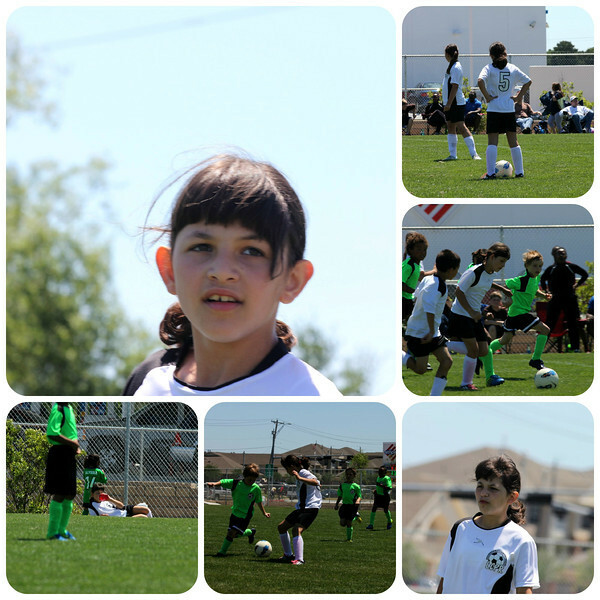 Annelise's soccer team faced off with a challenging team Saturday. Both sides gave it their all and ended up with a tie, 1-1. The bottom left photo cracks me up. Annelise was subbed out for a bit so she could be seen lounging along the sidelines enjoying her gatorade water mix. Peggy's youngest grandsons visited over the weekend and Annelise had a blast hanging out with them having spontaneous basketball tournaments, eating copious amounts of junk food, playing with their dog Jojo and trekking out to the railroad tracks numerous times to put coins down in the hopes they'd get smushed (yep, they did). Annelise came home with that crazed wild-eyed look that signals a bit too much fun and sugar was had by all. 01.) 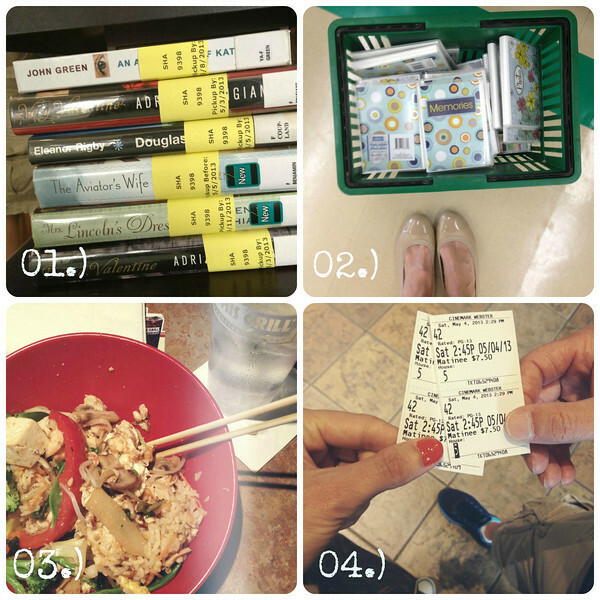 I am head over heels infatuated with the library's online hold system and get strangely (nerdly?) giddy when I get the emails telling me my books are waiting for me to pick them up. As evidenced by that stack, I get carried away and put a ton of books on hold at once and then as fate would have they all become available at once. I'm planing to read Mrs. Lincoln's Dressmaker and The Aviator's Wife first because they're in high demand and I won't be able to recheck them. We're having a special Mugs & Muffins at church this Saturday and those little albums are going to be turned into, not to brag, but... adorable favors. More on that to come! 03.) Since Annelise was living the dream playing with C & C Saturday afternoon, Scott and I treated ourselves to a little lunch date at Ghengis Grill. We really like going there but can only go when Annelise is otherwise engaged seeing as she loathes Asian food (we're hopeful this will change as she gets older) (and yes, we've given her plenty of chances to try it, much to her dismay). I really like Ghengis Grill even though picking out all the raw meat grosses me out. I try not to dwell on it. And? The guy in front of us kept coughing, so that was pleasant. 04.) After lunch we went to a matinee to see 42. And finally, it has come to my attention that I need a Revlon Lip Butter intervention. Clearly I have a problem. They are a mix of lipstick, balm, stain and gloss all rolled up together and there are oodles of fabulous shades available. As evidenced by my collection above. Saving grace: some were buy one get one 50% off. I wear the two on the far left the most, Sugar Frosting and Creme Brûlée but am trying to branch out into brighter shades of berry and red and even some coral (Peach Parfait is a pretty pinky peach with shimmer and Tutti Frutti is a sheer, bold coral). 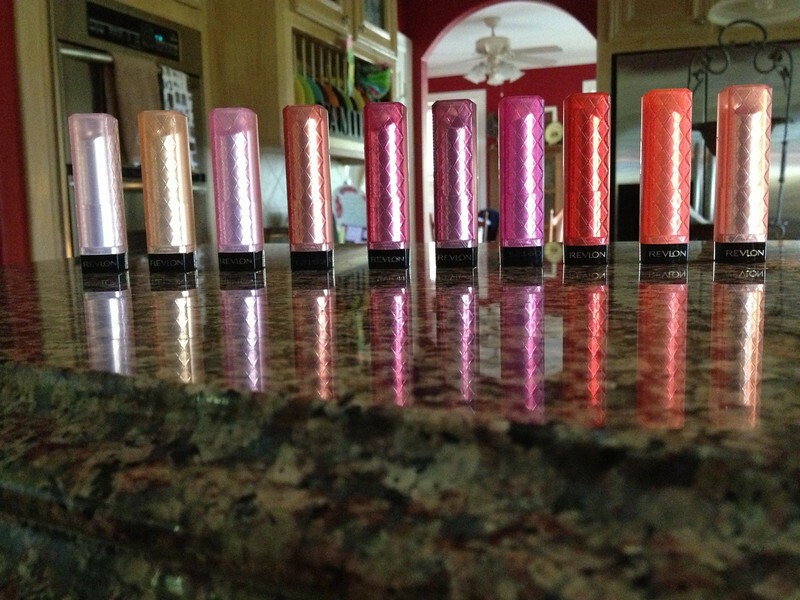 Have you tried Revlon Lip Butters? Do you have a favorite shade?